--- Unfortunately the 2018 edition of the Bull Run Raceway Bracket Nationals has been canceled. The Bull Run crew put a ton of effort into this event, but Mother Nature dealt them an extremely tough hand in getting this race in. We wish Bull Run the best of luck as they complete their 2018 season and look forward to seeing what they have in store for the 2019 Bull Run Raceway Bracket Nationals. Be sure to follow Bull Run Raceway on Facebook & visit www.BullRunRaceway.com for all the latest on the Rogers, Ohio based track. Bull Run Raceway in Rogers, Ohio will be hosting the Inaugural Bull Run Bracket Nationals over the weekend of September 7-9. This event will feature a massive purse of $32,000 spread out over the Saturday & Sunday $10K to win main events. There will also be a Test & Tune and First Hit Gamblers Race on Friday night at this race. The Pre-Entry price is $495 to enter Saturday & Sunday’s Main Events. There will be a max of 120 entries for this event that will be taken in order of when entry is received, so racers are encouraged to enter as soon as possible. You can enter online at https://squareup.com/store/bullrun-raceway-llc or check out www.BullRunRaceway.com for Check/Money Order entry instructions. For more info on this event or any other Bull Run Raceway event, go to www.BullRunRaceway.com or visit the track’s Official Facebook Page. This is aiming to be a huge event for sand drag bracket racers across the country at a great venue. We are proud to have the Bull Run Bracket Nationals on board with NSDN and will keep you posted with all the latest updates as this great event gets closer. Click "Read More” to view Full Event Flyers. The 2018 Avenal Sand Drags Spring Nationals was another one for the books with a record turnout in Central California. Racers came from across the west coast, as far away as Washington and New Mexico to compete at Avenal Sand Drags. The weather was very nice and comfortable early the in the weekend, before the heat not only cranked up on the track during Sunday Race Day but also the temperature as it reached into the mid-90’s. The heat certainly didn’t affect racing as there were many races decided to mere thousandths of a second during Eliminations. Here’s a rundown of all the action. The 20th Annual Heartland Nationals at Atoka Motorsports Park in Atoka, Oklahoma saw a great turnout of competitors make the haul to Southeast Oklahoma from as far away as California and Ohio. The racing was action packed with big money on the line in many classes, including $4K to win in both Top Alcohol & Top Eliminator. Our friends Gary & Michelle Burrow of Lonestar Graphics were on-site capturing photos from this great event. Lonestar Graphics has a full line of merchandise available that any photo can be placed on. Be sure to check out LonestarGraphics.com for their full Photo Galleries from the Heartland Nationals. Read on for a short photo recap we put together with photos from our friends at Lonestar Graphics. The 20th Annual Heartland Nationals wrapped up on Sunday at Atoka Motorsports Park in Atoka, Oklahoma. Terry Glasscock came out victorious in the ultra-competitive Top Eliminator class. Terry ran a 2.99 to defeat Vickie Hall’s 3.05 in the final round. 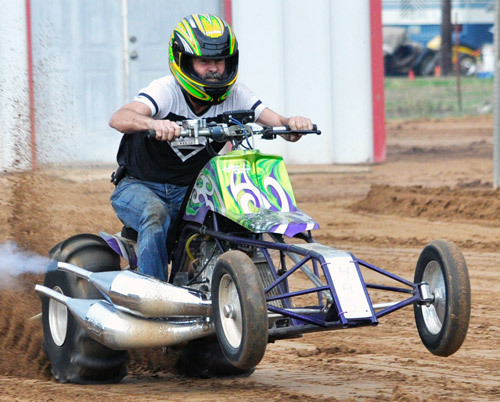 Pro Bracket winners on Sunday were: Jimmy Evans (Pro 1 Cars), Dylan Sivells (Pro 1 Quads) and Leah Steelmon (Pro 2 Cars). Congratulations to all the winners from this great event! Day two of the Lemoore Sand Drags May event saw some great racing action down the 300’ in Central California. The Top Eliminator (2.95 Index) class was contested for the first time at Lemoore this weekend and the racers adapted quickly with Paul Taylor pulling off a final round hole shot win over Aaron Bailey 2.98 to 2.97. The Pro Bracket classes saw familiar faces in the Winners Circle as Stacy Bolton took the Pro 3 category and Taylor Marchant was the Motorcycle Pro 1 winner. The Gambler’s classes were also hotly contested with young Tessa Nunes winning the Motorcycle Gambler while Brian Phillips piloted his Jeep to the Pro Gambler victory. Other winners on the day included Cole Tschacher (Motorcycle Pro 2), Jayden Pena (Juniors) and Dathen Hodson (Peewees). Run Sheets and Highlight Videos from this event are now posted.